Bloody Marys are a favorite staple for weekend brunch and a wonderful way to experiment with spices and garnishes! To make the HOFFY BACON SWIZZLE STICKS: Preheat the oven to 350ºF. Twist each slice of bacon, using both hands, to create a tight twist. Lay the bacon twists on a foil-lined baking sheet, pressing the ends down to hold the twist in place. Place a baking rack on top of the swizzle sticks to retain their shape. Bake for 15-20 minutes or until golden brown and crisp. Remove to paper towels to drain. To make the Bloody Mary: In 11-ounce highball glass, stir together vodka, bloody mary mix, lemon juice, hot sauce. Fill another glass with ice, then pour mixture into second glass. Pour back and forth 3 to 4 times to mix well, then salt, pepper and any other spices. 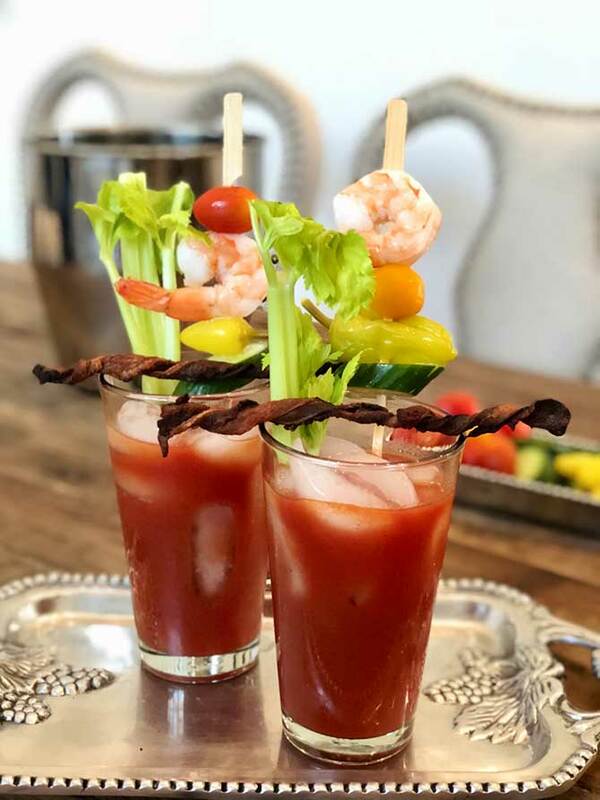 Garnish with Hoffy Bacon Swizzle Sticks and your favorites such as celery stalk, cherry tomato, and pepperoncini. ENJOY!